Chancellor Ronnie Green opens the State of the University address at the Lied Center for Performing Arts on Jan. 15. In the speech, Green outlined university goals through 2025 and beyond. Building upon the momentum of the University of Nebraska–Lincoln’s 150-year history, Chancellor Ronnie Green used his Jan. 15 State of the University address to chart a bold course for the institution’s next quarter-century. With 637 in attendance at the Lied Center for Performing Arts, Green opened the speech with a look back at the university’s greatest moments and impacts before outlining goals based on an aspirational visioning document created by a commission of more than 150 students, faculty, staff, alumni and stakeholders. “The choices we make today — like those made by our predecessors in the previous 15 decades — impact not just the generations represented in this room or in our lecture halls, laboratories, recital halls and the field today,” Green said. “Our choices impact generations to come. Released to the public Jan. 15, the plan was crafted by the Nebraska N150 Commission. The group, co-led by Donde Plowman, executive vice chancellor and chief academic officer, and Will Thomas, professor of history, was tasked by Green in March 2018 with creating a strategic vision for the university. The document was completed at the end of 2018 to be released as part of the university’s 150th anniversary celebration. “This vision is a clarion call for us to be a transformative, world-leading, 21st-century mission-integrated, Land Grant university without walls,” Green said. - Nebraska students will work with faculty, staff and campus leaders to co-create their university experience. Green said these experiences will equip students with a deeper capacity for analysis and reflection. - Nebraska-based research and creative activity will continue to impact lives in the Cornhusker State and beyond by advancing knowledge, solving the world’s challenges and deepening our understanding of humanity. The university will use these innovations to shape the education provided to all Husker students. - Every person and every interaction will matter as Nebraska grows into a community with an appreciation for diversity, inclusive excellence and the contributions of each individual. This includes work to align Nebraska as one of the most affordable and accessible educations in the United States. - Nebraska will expand engagement, serving as a catalyst for growth, prosperity and cultural enrichment, redefining the relationships that exist between 21st century research universities and their communities. The N150 Commission report is available online. In February, Green will call for an N150 Strategy Team to further develop a five-year implementation of the commission’s report. The refined plan will be presented to the campus community and put into place before the next State of the University address in February 2020. - Enrollment growth to nearly 29,000 students, with an incoming first-year class of 6,500 students. - A research and creative activity enterprise approaching $450 million. - Compensation, career development and research opportunities for graduate students and postdoctoral fellows that surpass levels of the top 50 U.S. research universities. - Community-based research in all colleges, connecting students to real-world challenges in Nebraska. - Expanded public-private partnership internships outside the university and available to all students. - An integrated engagement mission that includes earning designation as a Carnegie Community Engagement university. - Shared governance through an enhanced University Faculty and Staff Council. - Expansion of family-friendly policies and programs that continue to align the university among the best places to work in higher education. Among short-term priorities, Green called for the creation of a new budget allocation model. The hybrid responsibility center model would make campus units — colleges, departments, centers, etc. — responsible for revenue and expense streams. The ultimate goal of such a model is to allow units to match revenues to expenses. The new model is similar to budgeting procedures used at other Big Ten institutions, including Penn State, Indiana, Wisconsin and Minnesota. Like Nebraska, the University of Iowa is also working toward integrating hybrid responsibility centers into budgeting processes. Green said the model was recommended through a university committee and will allow for increased transparency when making budget decisions, enhance stewardship of funds, and provide a data-based foundation for resource allocation. The budget project is led by Bill Nunez, interim vice chancellor of business and finance. Green said the new model would shadow the existing incremental model in fiscal year 2020, with full implementation in 2021. In the coming year, Nebraska will continue to grow and update its research and education facilities. Pending construction projects include: converting C.Y. Thompson Library into a learning commons; Nebraska Engineering’s facilities expansion; the new Mabel Lee Hall; the Nebraska Food for Health Center’s gnotobiotic mouse facility; and renovating organic chemistry labs in Hamilton Hall. Green also called for Chancellor’s Commissions — specifically those focused on people of color, sustainability and women — to elevate their work in 2019. And, the list of Chancellor’s Commissions has been expanded to include a focus on the status of sexual and gender identities. The new commission will be led by Gwendolyn Combs, associate professor of management. Chancellor Ronnie Green's 2019 State of the University address kicked off the institution's 150th anniversary celebration. The chancellor closed the speech with a vision of two students — both born in 2020, one from Nebraska, the other from Mumbai — who pursue their passions at Nebraska. After making impacts on the world, the alumni return to campus, collecting accolades as part of Nebraska’s 175th anniversary celebration in 2044. 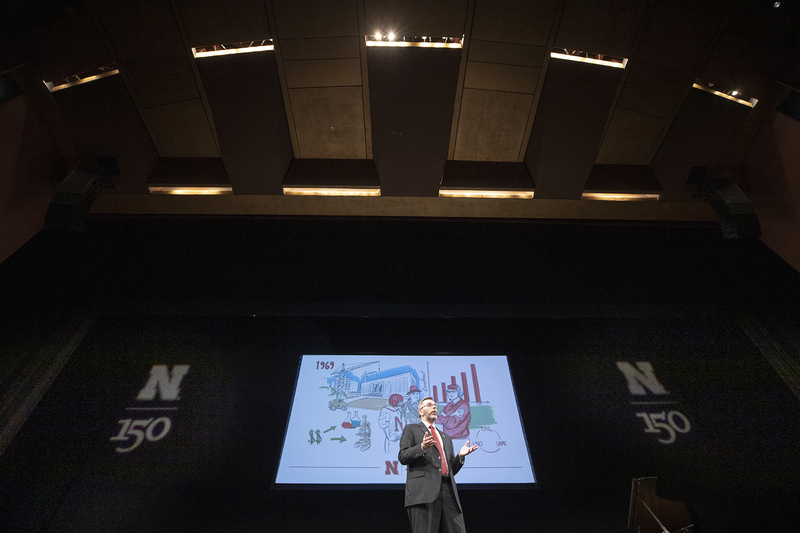 In the narrative, Green outlined how the two continue to be a part of the university community, taking additional courses and sharing their experiences with young Huskers. The vision ended with one of the Huskers becoming chancellor as Nebraska celebrates its 200th anniversary in 2069.